The Medulla Oblongata is a cone-shaped, neuronal cluster in the hindbrain. 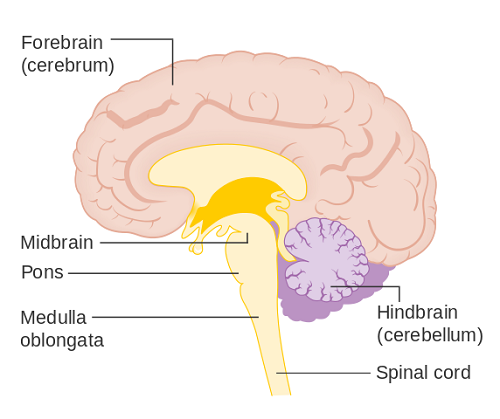 It is the lowest part of the brainstem located in front of the cerebellum and is connected to the midbrain by the pons moving down to the spinal cord. The main compositions of Medulla Oblongata are cranial nerve nuclei IX-to-XII, white matter tracts, and gray matter. It helps in transmitting messages between the spinal cord and various sections of the brain. It is responsible for controlling various autonomic functions in the body, such as digestion, blood vessel functions, heart vessel functions, breathing, sneezing, and swallowing. Median Fissures – These are the shallow groves situated along the posterior and anterior regions of the medulla. Pyramid – These are two circular masses situated on the opposite areas of the anterior median fissure. The medulla is connected to the spinal cord, cerebral cortex, and pons with the nerve fibers. Olive – These are coupled oval structures on the surface of medulla comprising never fibers connecting the medulla to the cerebellum and pons. Fasciculus Gracilis – The bundle of the nerve fiber tract extends to the medulla from the spinal cord. 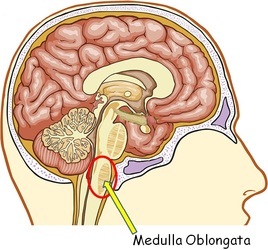 The Medulla Oblongata is located at the lowest part of the brain stem. It is one of the imperative parts of the brain that helps to regulate numerous important functions of the body. Any damage caused to Medulla is very difficult and sometimes impossible to fix. The Medulla Oblongata originates from the myelencephalon during the embryonic development. The sensory nuclei of medulla are produced from the final neuroblast of the alar plate, while the neuroblast from the basal plate gives rise to the motor nuclei. It is a conically shaped structure that decreases in diameter when extended inferiorly. With dimensions as the 2 cm diameter (at the largest area) and 3 cm length, its exact location is between the pons and medulla. The bottom margin of is identified by the origin of the 1st pair of cervical spinal nerves, which rests at the point from where the skull exits through the foramen magnum. There is a midline structure in the posterior median sulcus of the Medulla that extends continuously below to the surface of posterior median sulcus of the spinal cord. From the top, the sulcus ends exactly at the point where the 4th ventricle instigates. Moving laterally from the midline, the fasciculus cuneatus and fasciculus gracilis are identified, which are divided by the posterior intermediate sulcus. The anterior surface of the medulla comprises numerous structures that can be categorized into three broad categories/sulci – the Olives, the Cranial Nerves, and the Pyramids. The anterior median fissure is located in the midline of the medulla that is continuous along the spinal cord’s length. But, it is interrupted at some points by the decussation formed from the pyramids. Moving away from the midline, there are two visible sulci – the posterolateral sulcus and the ventrolateral sulcus. The internal structure of the medulla can be divided into two categories – the Ventral Medullar that comprises the pyramids, the olives, and the CN 9-12 rootlets; the Tegmentum Medulla that comprises the white matter tracts and CN nuclei. Pyramids – The Pyramids are the first constituent of the internal surface of the Medulla that is located the middle of the ventral medulla and the anterior median fissure. It comprises lateral corticospinal tracts and anterior. Moving down the pyramids is the corticospinal tracts decussation. Olive – Another section of the internal surface is olivary bodies or olives that are paired structures situated at the lateral aspect of the ventral medulla, lateral to the surface of pyramids. These olives are divided from the pyramids through an anterolateral sulcus, which is also known as pre-olivary sulcus. Also, there is post-olivary sulcus lateral to the olivary bodies. These bodies comprise the larger and superior bottom nuclei. The upper part of the dorsal medullar constitutes the lower part of the 4th ventricle. The 4th ventricle is a fluid-filled section prepared from the expansion of the spinal cord’s central canal. The 4th ventricle is encompassed by white matter from all around, having the gray matter on the inside. Cranial Nerves – The seven cranial nerves of the Medulla originate from the dorsal tegmentum that mainly exits the medulla ventrally. The cranial nerves X and IX and the roots of Xi exit the medulla at the post-olivary sulcus. The cranial nerve XII occurs between the olive and the pyramid at the pre-olivary sulcus. Anterior Spinal Artery – This artery supplies blood to the entire middle section of the medulla oblongata. Vertebral Artery – This artery supplies the blood to a region between the other two main arteries, and to the sensory nuclei, solitary nucleus, and fibers. Posterior Inferior Cerebellar Artery – It is a major branch of the vertebral artery that supplies blood to the postero-lateral region of the medulla. It is the region where two major sensory tracts function and link. This artery also supplies the blood to a part of the cerebellum. It controls the Autonomic Nervous System (ANS control) – In simpler terms, it is the automated nervous system that automatically responds to various situations when there is need to think and react. Medullar controls and regulates everything related to dilation of the pupils, breathing, heart contractions, and even the urge to urinate. It regulates the blood vessel dilation to reduce or increase the flow of oxygen and respond to the heart functions. It regulates the digestive system and maintains the levels of digestion within the body. From coughing, sneezing, to disperse the foreign particles from the nose, it regulates them all. 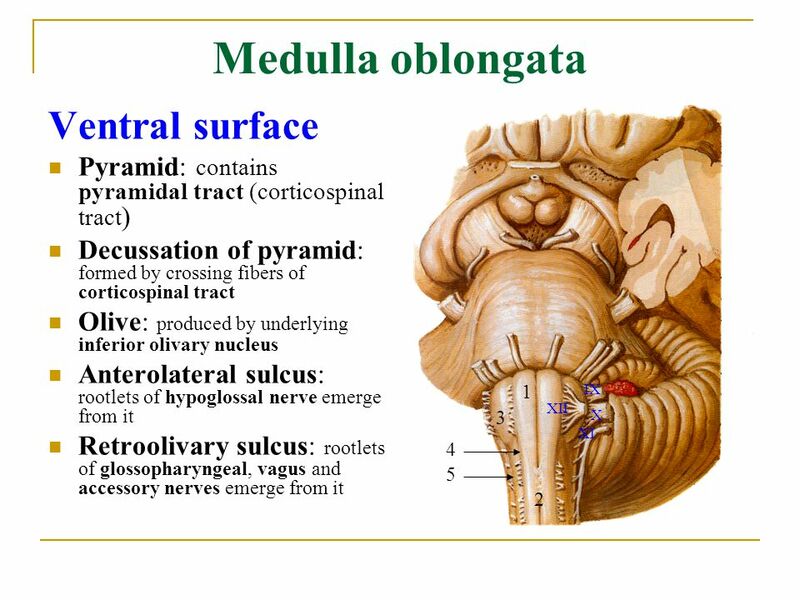 The medulla oblongata is also responsible for maintaining the coordination between various body movements. It even controls the respiratory and cardiovascular activities in the body. It looks after the blood pressure, regulates heart rate, and check the respiratory rate. All kinds of involuntary reflexes, like sneezing, swallowing, and gag reflexes are controlled and regulated by Medulla Oblongata. It also controls the voluntary movements of the body. There are numerous nerves that are vital for the head, shoulder, food digestion, and movement of the mouth. With the medulla oblongata, it is possible to send sensory messages to the central nervous system and peripheral nervous system. It even relates the sensory information to the thalamus, which is then sent to the cerebral cortex. The Medulla Oblongata may experience various types of damages or injuries that may result in a number of sensory problems. Some of the troubles are numbness, acid reflux, lack of control over the movement of various body organs, difficulty swallowing the food, and even paralysis. Medulla is responsible for controlling various autonomic functions in the body, like heart contraction, breathing, and more. So, any damage to it can be fatal to the brain and even result in the death of a person. Another major complication that can occur due to damage of Medulla Oblongata is a rare disorder known as a medullar abscess. This is considered as a condition of rapidly progressive numerous cranial nerve clusters and diminished levels of consciousness. The multiple system atrophy is a major neurological disorder that damages the nerves cells specified within the brain areas including the medulla oblongata. This ailment can result in loss of control over various autonomic ailments, like coordination, bladder control, and more. If you have met with a disease or disorder of Medulla Oblongata, then there is only one treatment available for it – Surgery. It is the first line method of treatment available for people met with a disease or damage to the Medulla. Most of the times, if the damage is severe, then it became extremely difficult for a person to even breathe and in such situation, it may result in the death or major ailment of a brain. For a tumor in Medulla Oblongata, it is possible to eradicate it with surgical methods. If the tumor is small in size and cystic, then you can expect a recovery in short time period. But if the tumor is large then this is a big challenge. It is because a failure of the surgery can lead to malformations in the body. The method of preoperative embolization is followed by large-sized tumors. But for asymptomatic tumors, it is essential to maintain long-term and meticulous observation as well as perform radiosurgery as and when needed. After the surgery, a person may even have to go through speech or movement therapy based on his condition. How are Medulla Oblongata damaged? If the nerves passing through the medulla oblongata or any component of its structure gets injured or damaged, then this may result in damage of medulla oblongata. A person met with such damage would experience loss of muscle, lack of sense of touch, trouble swallowing, and unbalanced body movements. How does Medulla Oblongata help in respiration? It detects the oxygen and carbon dioxide levels and sends the related signals to the heart muscles, diaphragm, and lungs. As a result, it can control the levels of breathing or respiration in individuals. Why is medulla oblongata important? 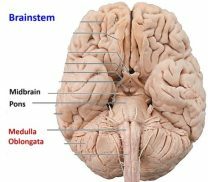 The medulla oblongata is an integral part of the brain that manages and controls various voluntary and involuntary functions of the brain. It is not possible to live without medulla as it performs a plethora of crucial tasks, like breathing, speaking, eating, blood pressure, and more.